Feature Article: November 2018 – AMMG Presents 2018 Alan Mintz, M.D. Award to Mark Gordon, M.D. 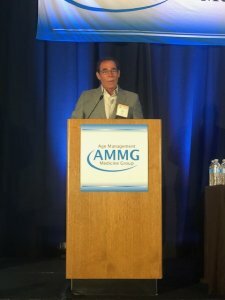 AMMG Presents 2018 Alan Mintz, M.D. Award to Mark Gordon, M.D. 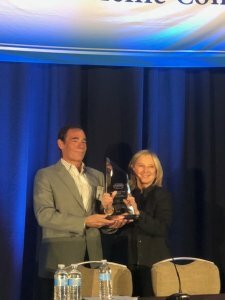 The award recognizes Dr. Gordon’s long and distinguished career, which in recent years has been marked by a singular determination to find and treat the causes of traumatic brain injuries (TBI), which have affected the lives and health of countless war veterans, athletes, and many others. Originally residency trained and board certified in family medicine, Dr. Gordon continued his medical education in clinical orthopedics, cosmetic dermatology, and sports medicine, prior to culminating in interventional endocrinology—a term which he coined in 2003. In 2005, Dr. Gordon received his exempt Pharmacist license from the State of California. After 15 years as a general consultant to the Medical Board of California, he was enlisted as a consultant in endocrinology, internal medicine and alternative medicine in 2015. Dr. Gordon has been a strong advocate of preventive medicine through the optimization of neuroactives and neurosteroids. He was instrumental in increasing the recognition of TBI as a cause of hormonal deficiency in a hallmarked 2007 presentation on ESPN’s Outside the Lines. His first book, “The Clinical Application of Interventional Endocrinology” (2008) is recognized by his peers as a dissertation on the standards of care and assessment for hormone replacement. His academic standards and medical knowledge were recognized by USC, where he holds the position of Voluntary Associate Clinical Professor (1998) in the USC Keck School of Medicine. As medical director of CBS Studios (2001), he has participated in studio projects in addition to outside projects with HBO, CBS, ESPN, CNN, FOX, and a number of international programs. Dr. Gordon has been in endocrinology for about 25 years, and for about a dozen years has been working in neuroendocrinology, which deals with the brain and hormones. In 2004, Dr. Gordon recognized the association between TBI, hormonal imbalances and neurobehavioral conditions. Since then he has focused intensely on this association, lecturing to both national and international organizations. In the course of his work he has developed laboratory testing and treatment protocols using predominantly natural products that allow patients to be taken off multiple medications they were prescribed for symptoms associated with head trauma, TBI or PTSD (Post-Traumatic Stress Disorder). He began working with veterans in 2009, has been funding veterans’ studies, and has gotten remarkable responses. In 2015, he was invited to give his TBI – A Hormone Dysfunctional Syndrome presentation at UCLA under the late Dr.L. Stephen Coles. Dr. Gordon is Medical Director of Millennium-TBI and Millennium Health Centers, Inc. in Encino, CA. In 2010 he became the Medical Director of Education for Access Medical Laboratories of Jupiter, FL, helping to promote the newest technologies in laboratory science. In 2015, Dr. Gordon released his newest book, “Traumatic Brain Injury – A Clinical Approach to Diagnosis and Treatment,” presenting the science and his experience treating all precipitating causes of traumatic brain injury in both military, veteran, sports, and civilian populations. Dr. Gordon joined forces with charitable organizations Warrior Angels Foundation and Task Force Dagger to provide services to members of the armed forces, both active and veterans. The incidence of TBI among veterans has been especially high due to exposure to IEDs (Improvised Explosive Devices), with shockwaves that cause injury to the brain even without any obvious outer trauma. Though in most cases the resulting symptoms are attributed to PTSD, that view has begun to change, and the causes of what is generally known as PTSD are now considered to be what Dr. Gordon said all along: physical rather than psychological. Many veterans were on a polypharmacy that created another form of disability associated with further cognitive and emotional turpitude. Dr. Gordon has gotten great results with non-invasive, non-pharmaceutical based protocols that work to end the confusion, depression, and suicidal tendencies prominent among TBI sufferers. Dr. Gordon’s Millenium-TBI Centers joined with the Warrior Angels Foundation to offer retired Special Operational Forces an alternative approach to their current treatment for PTSD. 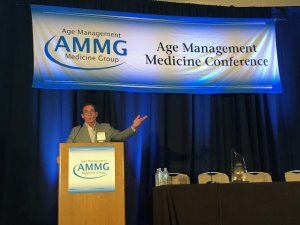 Since November 2016, Dr Gordon has been presenting his course, Traumatic Brain Injury: A Clinical Approach to Diagnosis and Treatment, as a pre-conference track at AMMG’s Clinical Applications for Age Management Medicine conferences. In November 2017, Dr. Gordon presented AMMG conference attendees with the results of the Three Year Veterans Traumatic Brain Injury Study. Veterans were enrolled on a first come basis into the TBI project, where each was drawn for neurosteroid and neuroactive steroid assessment along with a few markers of inflammatory risk (DHEA-s, Vitamin D3, Pregnenolone, Androgens and Estrogens), SMAC24, and CBC. Based upon their results, the median of the range for each marker was used to direct treatment. An average of 6 nutraceuticals were used along with Clomiphene citrate and/or natural thyroid replacement when indicated. Enrollees were given the Millennium Program Questionnaire (MPQ) every 30 days as a subjective on treatment and monitoring laboratory testing every 3 months. With the backing of literature supporting this approach to TBI/PTS, the 3-year study from 2014 to 2016 resulted in 58 medically disabled veterans having their lives back and being off 90% of their medications. Dr. Gordon is especially proud of his work with the Warrior Angels Foundation, which was founded in 2014 by a severely injured ex-Green Beret, Andrew Marr, and his younger brother Adam. The 501(c)(3) organization funds treatment for veterans, since neither the VA nor insurance are yet covering this type of treatment program. Dr. Gordon told us he has also been approached by, and worked with, some of the most elite and secretive parts of the military, who have caught wind of the fact that his treatment methods, while still considered unorthodox, actually work. Photos: Dr. Mark L. Gordon is presented with the 2018 Alan P. Mintz, M.D. Award by Dr. Florence Comite.